What’s the DPLC all about? Take a look through our photos from the past few years and see for yourself! Our Pancake Breakfast was still going strong in its fifth year, thanks to supporters like you, great candidates for the 2019 May special district election, and progressive organizations like CALC, HCAO - Lane County, Indivisible Eugene, NOW South Willamette Valley Chapter, Sister District, and WAND. Canvassing with Team Oregon and No Cuts to Care, the Young Democrats of Lane County challenging the College Dems to a phonebank challenge and winning handily . . . it all happened during the 2018 general election. We held our inaugural Springfield event, the Spaghetti Slam, on September 21 at Willamalane Adult Activity Center. We’re thrilled to start a new tradition in Springfield! For more than a decade, we’ve pitted Lane County House Districts, campaigns, and organizations against each other at our annual Chili Cookoff. This year’s winner was Senator James Manning’s entry from Senate District 7, with a special “DeFazio’s Choice” prize given by our Congressman to the Young Democrats of Lane County. Celebrating the Fourth of July in Creswell is a DPLC tradition. We couldn’t ask for anything brighter and more patriotic than the bright red convertible that East Lane County Commissioner candidate (and now Commissioner-elect!) Heather Buch’s campaign led us with. The Community Action Committee’s first-ever Civics Fest at Amazon Park aimed to teach young people about government - and to have some fun along the way. 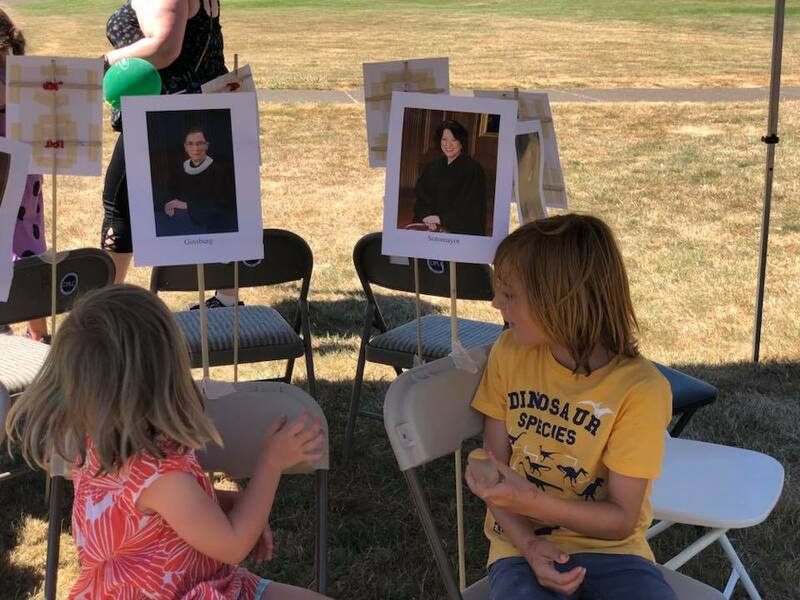 SCOTUS musical chairs, legislative branch go-fish, and DIY buttons were all part of the event. Our pancake breakfast fundraiser was in its fourth year in 2018, and we again served up a hearty breakfast of flapjacks, eggs, fruit, and bacon. This year we were joined not only by local campaigns and elected officials but by community organizations looking to connect with hungry progressives. The May primary was full of great Democratic candidates - and between the DPLC and all the campaigns, we knocked on over 90,000 doors. One possible secret to such motivation? A Harry Potter competition devised by DPLC Field Organizer Emily Mooney that had every volunteer earning GOTV points for their Hogwarts House. Our biennial fundraising dinner honors the legacy of President Franklin Roosevelt - and not just the cardboard cutout version. “Standing Strong” was the 2017 year’s theme, highlighting all the principles - including justice, equality, and immigrant rights - we stand for as Democrats.